To celebrate their 10th anniversary, the Salida Circus has created an over-the-top and extravagant display of costumes, posters, and circus-inspired artwork in the Paquette Gallery. This exhibit, which will be on display for the month of May, is part of the Salida Circus’ weekend-long anniversary celebration. For more information, please visit their website here. Join the Salida Council for the Arts and the Salida Creative District on Thursday, May 11 in the Paquette Gallery for a fine and festive social hour from 5:30 to 7 pm. Munchies are served, the cash bar is open, live keyboard music will be playing, and you’ll hear news about SO many creative projects being launched. Join us, bring your friends, meet some new ones, and, if you have news about your own artistic endeavor, you’re invited to step up on the “Soapbox” and share the excitement. Please join the Salida Circus for an artist’s reception on Saturday, May 13 from 5:00 to 7:00 pm. Free hors d’oeuvres, beer, and wine will be served. 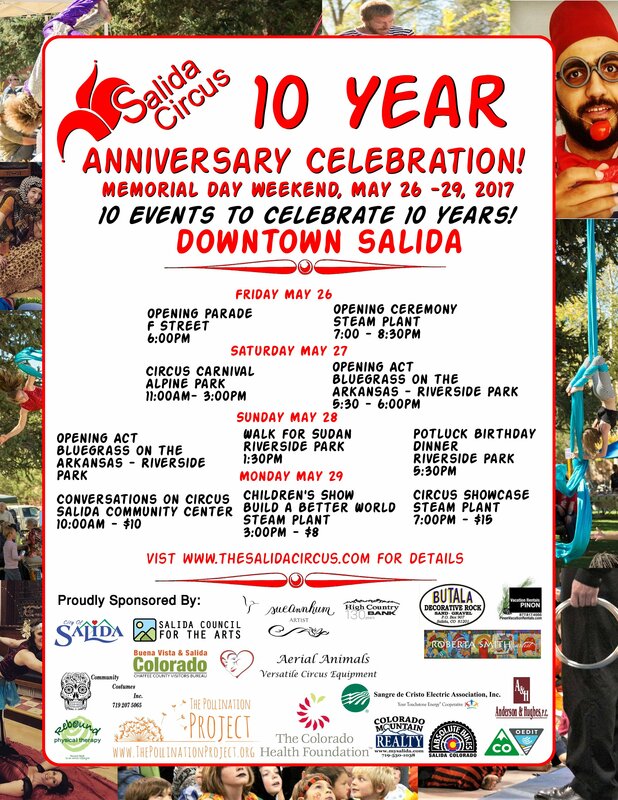 For all the details on the many events celebrating Salida Circus’ 10th anniversary, please check the schedule on the Salida Circus website here.